Love this, I may have to do some sloshing myself! So glad you joined us at CASology this week - oops, you didn't - go fix that right away! lol! Just love how you colored this, Shirley! And such happy colors, too! We haven't seen too much of the sun lately, so this made me smile! Shirley I love this, the yellow is awesome. Love the sloshing!! ...and thank you so much for sharing with us at CASology! Love this bright yellow card - it couldn't fail to bring a smile to someone's face! Here we go - sloshing again - just LOVE it! I love this sloshy effect!! BEEE-utiful!!! I think this is terrific. Too bad the stamp is discontinued. I love it and what you did with it. Your watercolor skill blows my mind Shirley! I ADORE this and it is so lovely the wash of colors outside the lines, YAY, so free and still so lovely!!!!!! I love that you chose bright, fun yellow for your flowers...so pretty! And, I love your expression "Bit of sloshing, bit of splatting, done! "...you're too funny! I was looking forward to some more sloshing and you certainly didn't disappoint! As far as I can see you are the Master of sloshing and splatting! Love your card! Love your technique with this card! Your "sloshing" is indeed lovely, so bright and pretty with the delicate definition provided by the stamp. Wow! 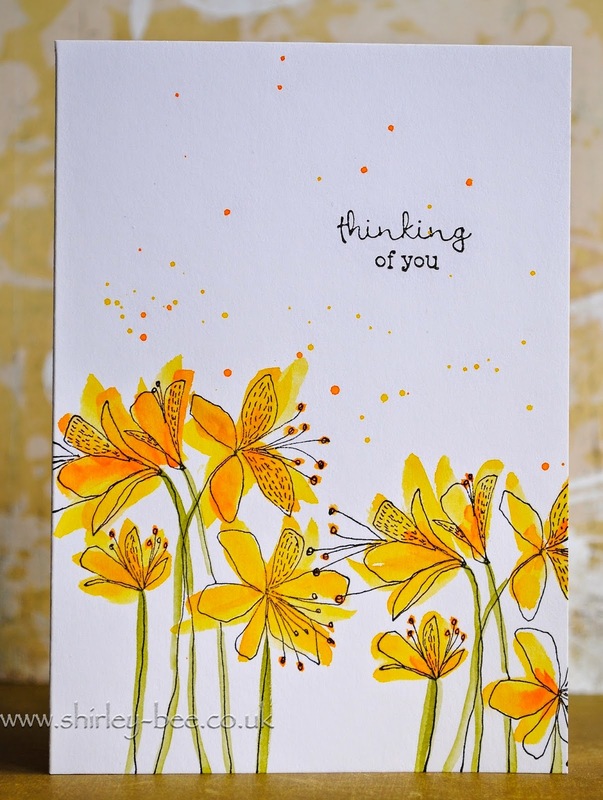 Your card is a sheer delight, great stamped image, colouring FAB and superbly CAS. This is just beautiful. I love your slap dash coloring. Thanks so much for playing along at CASology this week. This is so cheerful, it really made me smile! Shirley what a great CAS OLC. I love the yellow, another color would not look as great. Shirley this really stands out from the thumbnail, stunning! I just smile when I look at this card! Such liberated, happy flowers! Love everything about it! Shirley, I must admit I have never slouched colors across an image...but this card is the exact reason I need to try it! WOW!!! This is so amazing...I adore this card! So glad you joined us at CASology!!! PS - I missed my typo - I meant "sloshed," not "slouched!" Beautiful card, beautiful image. TFS.